I mentioned that I started my culinary career at Disney’s Animal Kingdom (DAK) Catering department. It was a super small team- at most 7 people. We got to be very close, and have always remained like family. We executed amazing events that we surprised ourselves with. Hundreds and thousands of guests were fed out of a tiny little kitchen and with a pretty green bunch of cooks. Luckily we had a few veterans that led us, and gave us all a great culinary foundation. Full of good memories and full of amazing food! My favorite recipe that I took away from “DAK Catering” is the White Chocolate Bread Pudding. I love this- so perfectly sweetened, lots of rum and deliciously rich. Loved it enough that when Sir Wes and I got married (he was one of the seven that worked with me); we served it at our wedding as a nod to where we met. 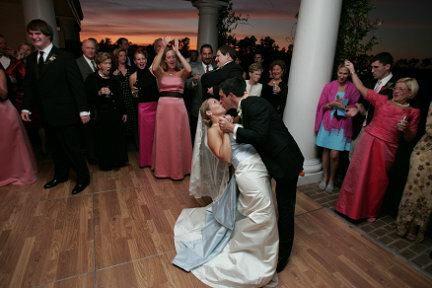 After 7 years of happiness, Sir Wes and I are still celebrating with it! 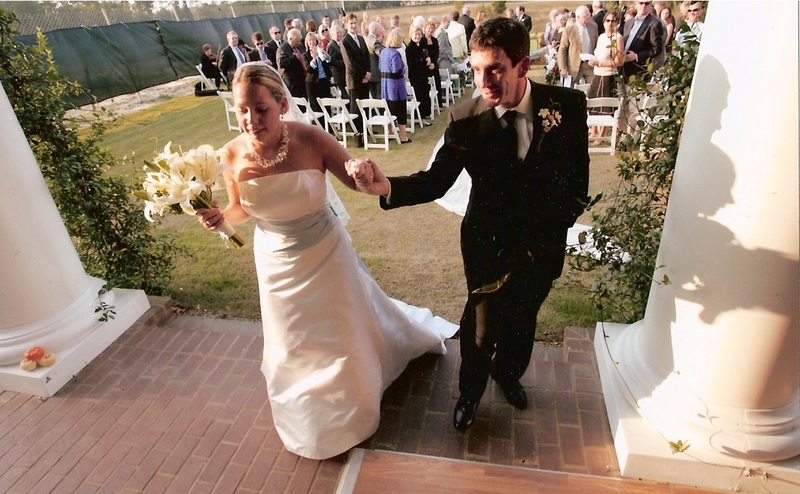 Happy Anniversary to the guy, that drove me crazy every day; and who later became my best friend and partner in life. Slice pound cake into 1 inch cubes and place evenly into mini casserole dishes. In a mixing bowl, combine eggs, cream, milk, rum, sugar and cinnamon and blend well. Pour even amounts into the casseroles, filling to almost the top. Distribute the chocolate evenly around the casseroles, leaving a few pieces on the top of each dish. Put the casseroles on a baking sheet in case they bubble over and bake for 45-50 minutes until center is set. Best to serve right out of the oven as they soufflé up and look awesome with the rise. Putting the white chocolate on top lets it get nice and toasted- this is the best bite of the dish. I think to this day, we would all agree it was the best team we have worked with, and probably had the most pride in what was accomplished. 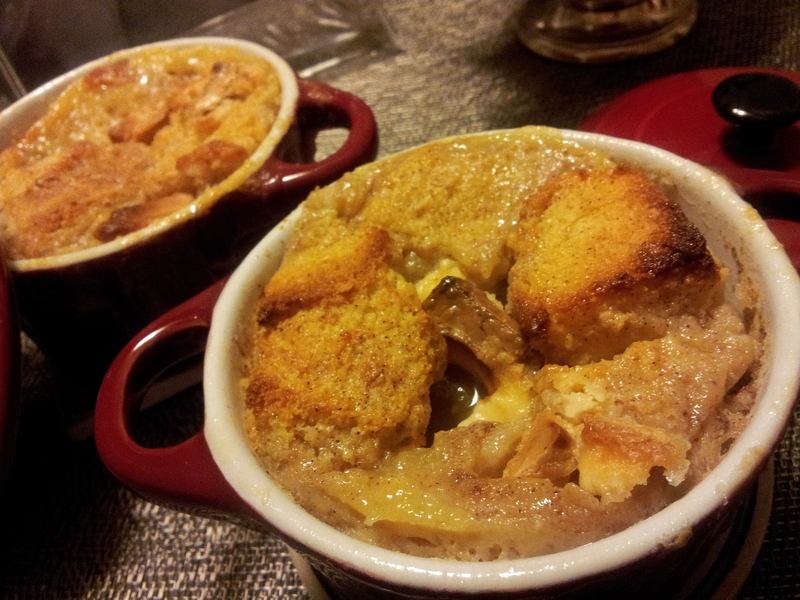 And this bread pudding is definitely the dish that has been most requested in my life. Cheers to a wonderful family born thru work, and a continued life time of happiness to my best friend. Happy anniversary Sir Wes! This entry was posted in Bread Pudding, Desserts, Recipes, Uncategorized and tagged Catering, Disney's Animal Kingdom, White Chocolate Bread Pudding. Bookmark the permalink. The pleasure has been all mine. I love you girl! Bread pudding is one of the most wonderful and comforting treats of all time! This looks delicious. Happy anniversary!